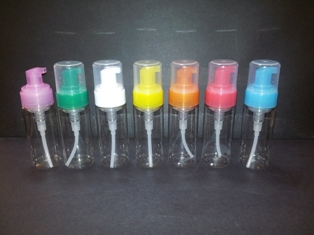 We are extremely applauded in the market as a foremost firm of Foaming Pump Bottle. These Pump are developed using the advanced technique and optimum quality input which is sourced from dependable sellers of industry. Owing to its varied qualities like low maintenance and top strength, our offered Foaming Pump Bottle are extremely used by our clients. Founded in 1981, V. Kumar Bottle Wala is one of the well-known organizations, extremely indulged in manufacturing, supplying and wholesaling a board range of products such as Pet Bottles, HDPE and PP Bottles, Cosmetic Jars, Plastic Jars, Tablet Containers, Spray Pumps, Spice Jars, Housekeeping Bottles, Plastic Boxes and Plastic Canes. Our products are extremely well-liked by our customers for their sturdy structure, longer life, water resistance, elite designs, smooth surface and affordable prices. These products are made employing the sophisticated technique and top quality input which is sourced from dependable dealers of market. In addition, with the aid of our well-informed personnel, we present these products in varied sizes and designs in order to meet the variegated requirements of our esteemed customers. Our customers can obtain these products from us as per their necessities and needs within prearranged time-frame.